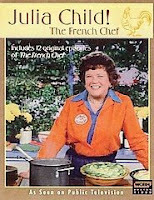 All I need as a title to this story is to say Julia Child. The icon of the culinary world is more to the forefront today with the upcoming movie about her culinary awakening and the young lady who prepared the 500 plus recipes from the Mastering the Art of French Cooking in a year. The movie Julie and Julia is premiering August 7th, a date not that far from the anniversary of Julia’s birthday and her death.